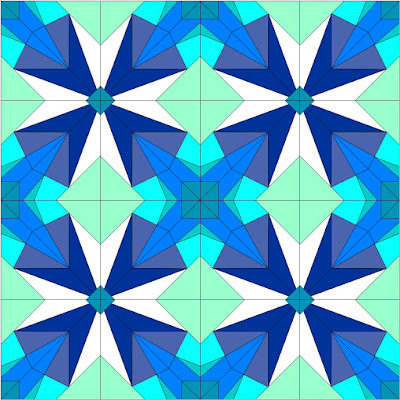 UPDATE: 'Atomic Bloom' Block in three (3) sizes is now available for purchase in my Craftsy Shop! 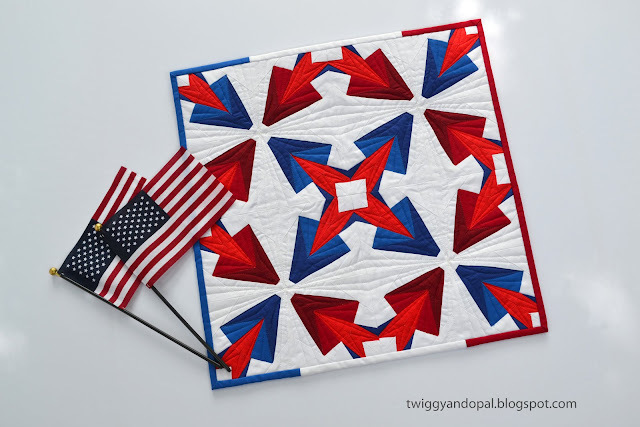 Welcome to Day 2 of the Patriotic Palette Blog Hop! It may not be the 4th of July, but it's never too early to start the celebration! A Blog Hop for inspiration and a Giveaway! Woo-Hoo! The instant I said yes to this Hop, I knew what I wanted to make! 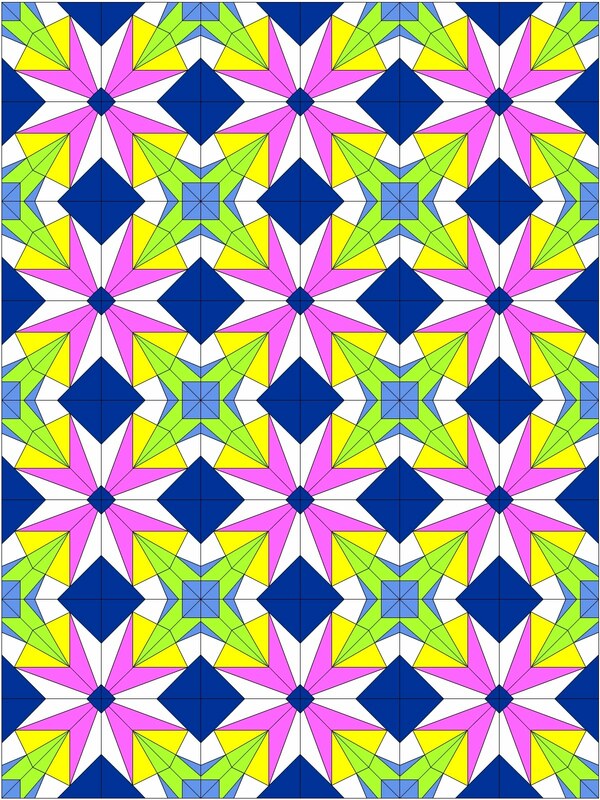 The beginning of May I designed a paper pieced block called ATOMIC BLOOM , and this would give me a chance to play with the block, design and size for my mini quilt. EQ7 was invaluable for figuring out color and block placement. The secondary design is always intriguing. 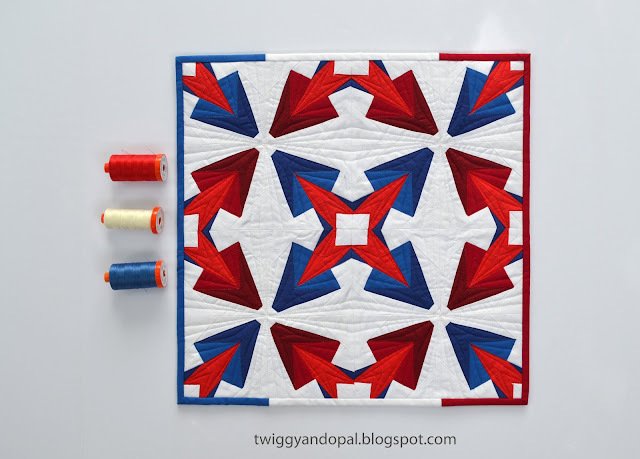 This mini quilt is a Kaleidoscope of red, white and blue...Rockets Red Glare, and gets you in a celebrating mood! I was provided a bundle of fabric from the Painter's Palette Solid collection and asked to kick off the celebration with a project inspired by the color palette. If you know me, you know I love solids! The Painter's Palette solids are amazing! When I received my bundle, I couldn't stop touching them! The quality and feel is just that good! We received three (3) blue, three (3) red and one (1) white fat quarter to work with. These I can work with! The first step was printing templates. If I'm doing a complicated paper piecing project, I always color my template sections to match with my fabric choice. It makes it easier for me to keep track of things. My quilt will have 16 blocks, each one will be 4 1/2" unfinished. And then there is cutting all the pieces! For this piece alone there are 304 pieces! I figured out the size I would need for each section before I did any cutting. Even then, I still made a cutting error! All the parts and pieces came together pretty quickly! There were no extra fabrics pieces or templates left over! I added triangles to the sides and bottom of each block and trimmed all 16 squares to 4 1/2". I stitched four (4) 4 1/2" blocks together to make one 8 1/2" block, stitched the four (4) larger blocks to finish the top. It made it a little easier to keep things lined up...as best I could! You know what the best part of this design and pattern to me is? I can't believe I'm saying this, but it's the quilting. 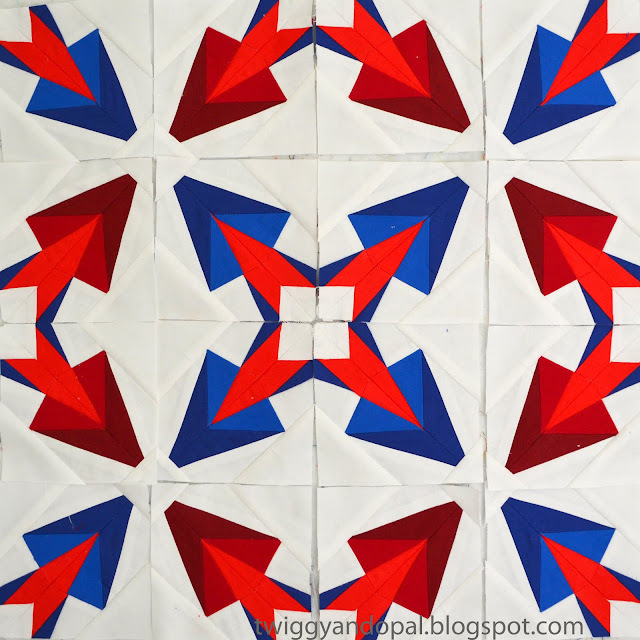 With the shapes and lines of the block, I can quilt geometric lines with ease. It's almost like the seams are a quilting guide. I like to plan out my quilting so that there isn't a lot of threads to bury. I'll sit and trace my finger on a path until I'm satisfied I am making the best moves! Is that weird? Having the perfect thread colors to finish a perfect (perfectly finished!) project is the cherry on top for me! I used Aurifil 50 wt in Lobster Red (2265), Delft Blue (2730) and Chalk (2026). I couldn't decide on one color to use, so I opted to use three! It works...it's very patriotic! It can be fun playing with bindings. So much work goes into our quilts why not put more into bindings once in a while? Not all quilts, and mini's are a perfect way to scratch that binding creativity itch too! I used the lightest blue for the backing as I couldn't work it into my design. Each and every color in the bundle has been duly represented! The quilting detail! I used my walking foot for this. There was a lot of turning, but since the piece is small it still went pretty fast. I think one day I'll attempt something like this using free motion quilting. One day when I'm adequately relaxed so I can become one with my machine!! In a way, these blocks in these colors remind me of bottle rockets. When I was younger it seemed like we had hundreds and hundreds of bottle rockets. We'd shoot them off all day and night for weeks before and after the 4th of July! When I say we, I mean my brothers. I was never a fan of lighting the fuse! I was more of a sparkler kind of girl. Drawing shapes in the dark with the sparks flying everywhere! 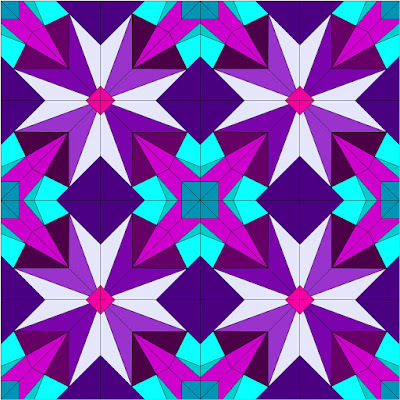 I had every intention of launching my 'Atomic Bloom' block pattern today, but I just couldn't pull it off! I am working on it and hope to have the pattern available in my Craftsy Pattern Shop in the next few days. 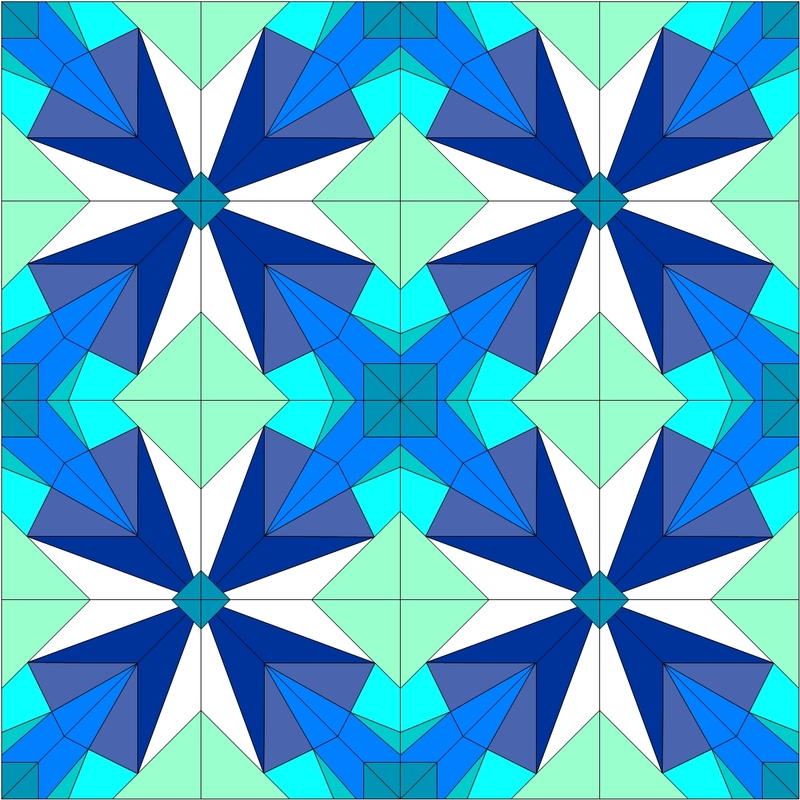 There will be 8", 12" and 16" blocks in the pattern. Options for colors! Of course I have some! Before we get to the giveaway, here are the others blogs that are participating in the Patriotic Blog Hop. There will be tutorials, inspiration, good clean fun...and they may have a giveaway going on too! This Blog Hop and Giveaway is sponsored by PB Studios. Thank you so much for including me in the challenge! A huge thanks to Lisa Ruble, I appreciate all your hard work on putting this together! And now the GIVEAWAY!! 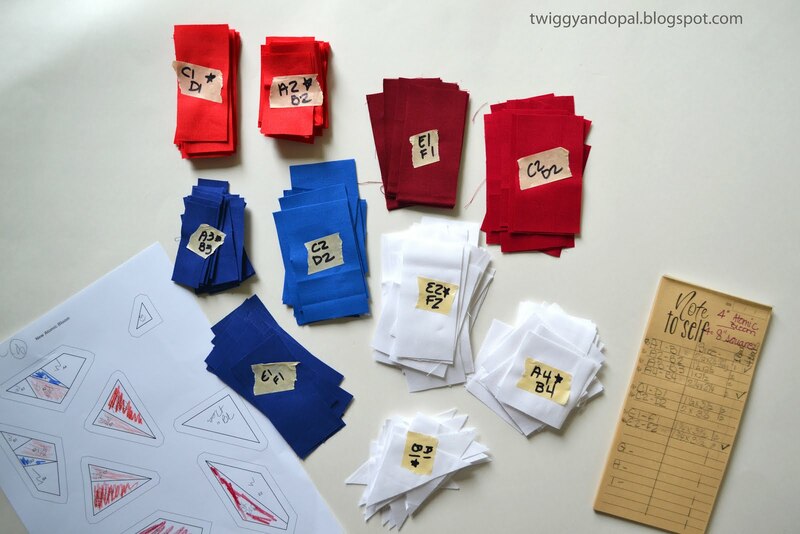 Wouldn't you love to win a Fat Quarter Bundle of all seven (7) of these Patriotic solids?! Sign me up! Leave a comment telling me what your favorite 4th of July beverage is! If it's Rosemary Peach Lemonade ... then you must give me the recipe! I usually just drink Watermelon iced tea. Tastes wonderful. Homemade Strawberry Lemonade, I can it in the early spring so I have it for the rest of the year. Crush ice in the blender add the homemade concentrate and a touch of strawberry liquor when nobody is looking. My favorite 4th of July beverage is Coke. We don't drink pop often. Usually on the 4th we go to a picnic. Pop is readily available. It's one of my splurges. Basically anything with rum in it! I just love Coke, Dr Pepper or good sweet tea (it's not all done well! HA!). Favorite 4th of July beverage is strawberry/watermelon lemonade garnished with pieces of strawberry and watermelon. Rockets are flying on your post! We drink strawberry Koolaid. Raspberry Lemonade ;-) Remember those Patriotic Popsicles - called a bomb or somehting like that? That what your blocks remind me of - great memories of summer!!! 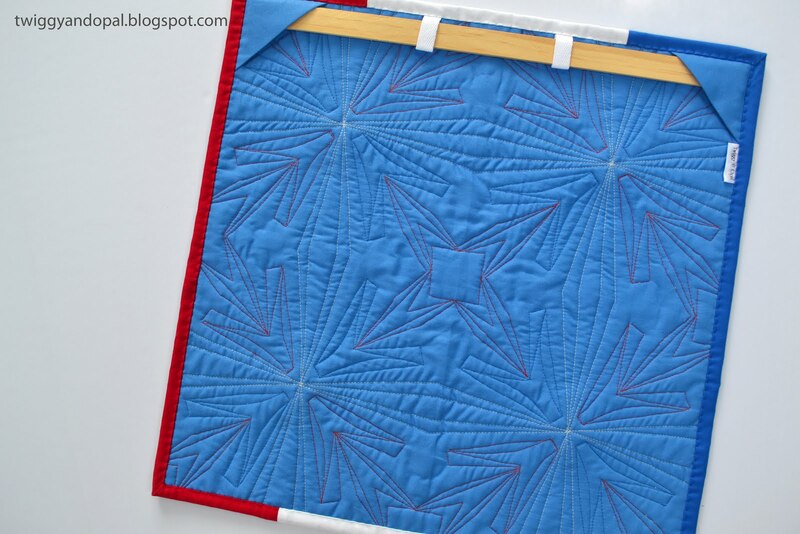 great block and fantastic quilting! Congrats. I like plain lemon or limeade with mint. This is such a great design, Jayne! It surely sparkles in these colors...and your other colorways are amazing too! I am thrilled with the quality of the PBS solids! I don't really have a favorite 4th beverage, so how bout a good ol PBR, in a red white and blue can? :) Cheers!!!! Ice cold Coca Cola or Raspberry Lemonade have to be my favorites. I usually need a lot of either or both of these after walking downtown for the 4th of July parade and then walking through the meadow to view the vendor booths. 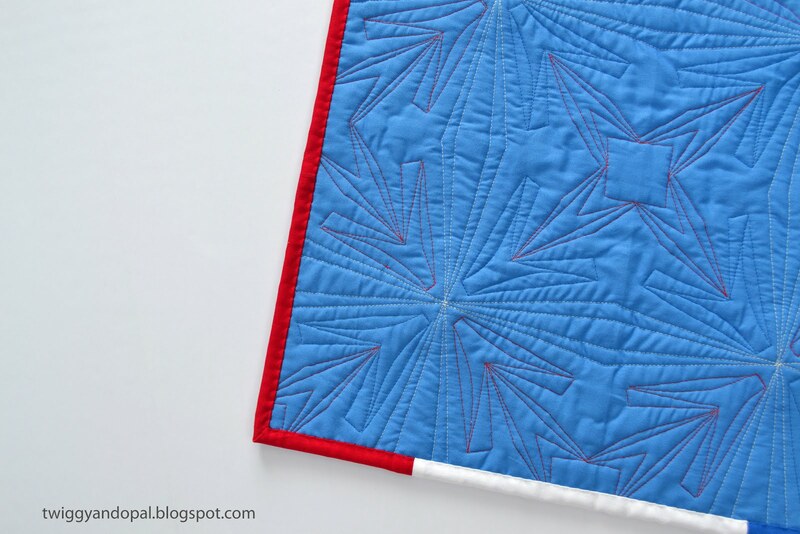 Love your mini quilt and the quilting. Will be thinking about that pattern as we celebrate our 46th anniversary! I really like frozen lemonade. A cold Coke in a bottle - so refreshing! I'll be looking for your awesome pattern on Craftsy. Love how this turned out!! I need to hop on over to Craftsy!...Fave drink is peach tea in the summer. I'm a fan of sweet tea with lemon. I guess it would be my everyday favorite: iced tea. My favorite summer drink is a blended ice coffee. Sangria for celebrations. But I have to agree with Fribble as well, iced tea is my go-to summer favorite. I love sun tea in the summertime. Your mini is gorgeous as usual!! Ice water is my favorite drink in the summer....well pretty much anytime. =) Thanks for the giveway! STRAWBERRY LEMONADE! THANKS FOR SHARING!!!! My favorite is homemade lemonade-freshly squeezed! Wonderful mini-quilt! That is a lovely design - thanks for the tutorial! july 4th is all about iced tea with lemon or lime. love your mini. My favorite beverage for July 4th and all summer is iced tea with lemonade. I mostly just drink water, but will be adding slices of fruit this year. Apples, oranges, and maybe lemon. Thanks for the design. An icy cold Coca Cola for me. Although, some of these suggestions sound great. Maybe you could organize a recipe post, where we could the instructions for things like "watermelon iced tea"...as if you're not busy enough! This is so pretty Jayne! I love what you've done with it. 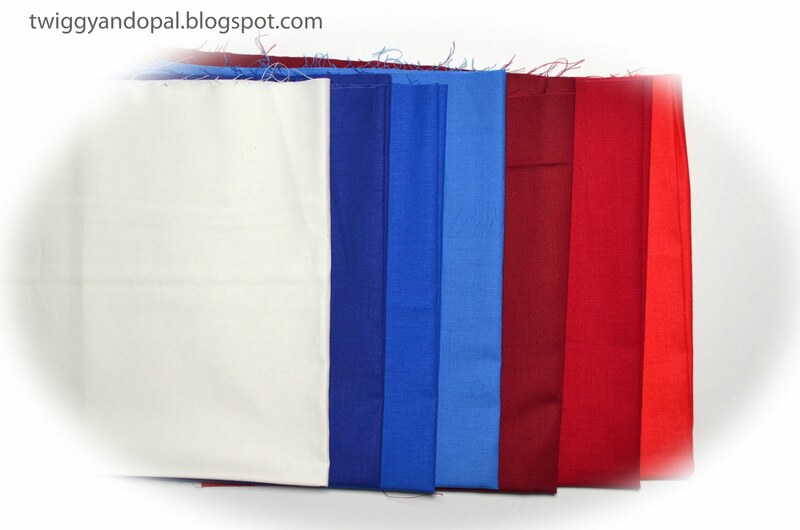 I actually find red, white, and blue difficult to use together because of the major contrasts between them. They don't often play well together-- except in the flag, of course! I also hate burying threads and will try to work it so that I go off an edge instead of stopping somewhere in the middle just so I don't have to bury anything, so I don't think it's weird at all! My favorite summer beverage is anything with lots and lots of ice! This is so fantastic Jayne! I'm a typical southerner and love me some sweet tea! Raspberry Lemonade is my favorite. It's a great mini too! My favorite drink is ice cold Sun Tea flavored with fresh Raspberries from my raspberry patch. I just want to add that your "Atomic Bloom" pattern is magnificent! Have a great day! I see so many different shapes in your Atomic Bomb! Fidget spinners come to mind too. And the blue and teal remind me of morning glories, so lovely! I love Sangria for Summer! Love your quilt. I like white sangria with fresh berries & watermelon. I really love your quilt and your EQ7 alternative colors are delightful. So many pieces for such a small quilt. You are one brave lady. How about root beer floats on the 4th of July? I love them and since it is always hot they really hit spot. Make home made ice cream for an even better taste!! Hiya Jayne!!! 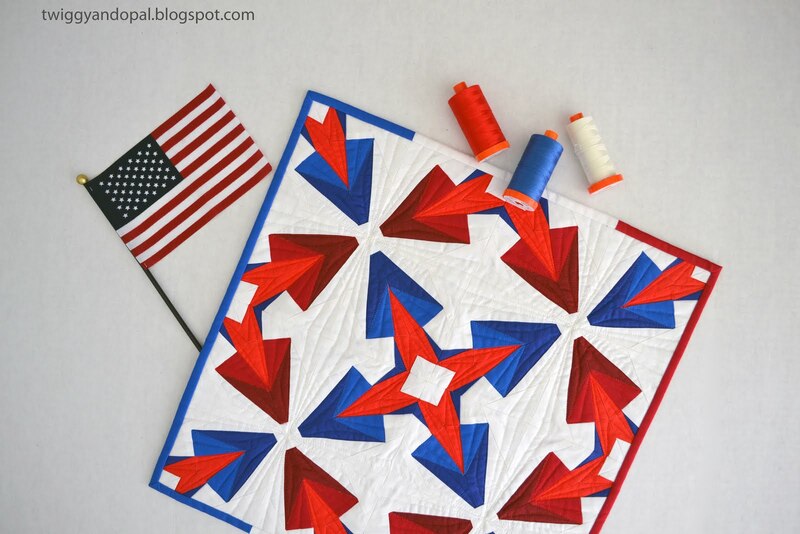 I love this little quilt, so very patriotic. Down here in North Carolina we love our sweet ice tea. It's one of my favorite drinks year round. Thanks for having the giveaway. Blessed be, hugs!!! You did a great job with your mini quilt...it looks like rockets about to explode! I usually like to drink an ice cold beer if it happens to be hot on the 4th. what a great block and tutorial! I love just plain lemonade the best or iced coffee! Make mine tomato juice, vodka, and a dill pickle slice. Peach Mango iced tea or iced coffee with mocha please. Hand squeezed homemade lemonade is a delicious choice for the 4th of July. Summer holidays cry out for tonic & lime and, even sometimes, some gin too! Very thirst-quenching. I make a mint, lemon grass, lemon balm, stevia lemonade that is delicious! We drink it at other times of the year as well. I'm old-fashioned (and old). Lemonade is traditional for me. 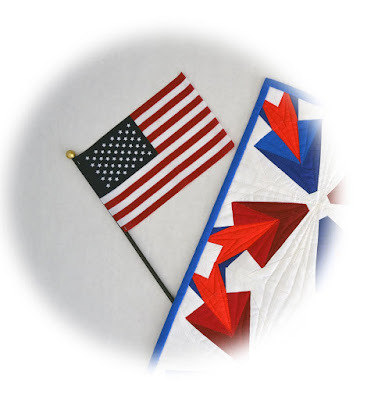 I love your patriotic mini quilt. I like pink lemonade. It's so neat to see your pattern after those teases on instagram. It's so crisp and snappy. I have to say that I was thinking bomb pop when I saw your early photos. (A kind of popsicle here--don't know if they're popular everywhere. Way to go! I worked with that line of fabric and really liked the saturated hues. Not sure I have a favorite 4th drink. I love Coke and lately have limited myself, but for a holiday I'll probably make an exception. I do like vanilla rooibus iced tea, too, though. Hmmm... Mike's Hard Lemonade is pretty danged good - super-chilled, of course! Really cold iced lemonade is my favorite. My 4th of July beverage is suntea. I'm a fan of anything red, white, and blue! My favorite summer drink is iced tea, sometimes plain, sometimes flavored with fruit. I'll be drinking lots of ice water on the 4th, and maybe a beer or two in the evening. Love your new block design, and your mini quilt is fantastic! My favorite 4th of July beverage is rhubarb punch! Lemonade is a favorite of mine but ^ Mary's rhubarb punch sounds delish! Thanks!! I love Amaretto and Coke. It makes an amazing cherry Coke, with enough alcohol you can drink it all day before the festivities start. My favorite drink is water. To make it festive, I might put some lemon or mint leaves in it, but for a 4th of July beverage, lots of ice is probably the most important addition! Your mini quilt is absolutely gorgeous, I can see where you would see the bottle rockets, we always had a bunch of them on the 4th too, my grandkids would have a ball after the major fireworks were done and yes they lasted for days. I can't wait until your pattern is available it would be a beautiful quilt not to mention the different color combinations. My favorite 4th of July beverage is peach sweet tea with a shot of peach schnapps over ice with a sprig of mint, can't get any better. My favorite is iced tea followed by draft beer! Thank you. My high school track coach once said, "Your favorite beverage is water." And I believed her. So water with a lot of ice is my favorite on any hot day, including July 4th. Love your bottle rockets! That's what I thought of when I saw the peek of your blog on Bloglovin. I'm sure the 4th will be as any other summer day, Iced tea with a slice of lemon. Some of us work retail and since the 4th is a Tuesday, we'll be there selling you hot dogs, ice cream, cherry pie and other picnic goodies. Mmm...I like diet ginger ale with a piece of citrus peel and splash of Pama, (pomegranate liqueur) wit a lot of ice. This mini turned out great! Most of the time, I stick with simple water to drink. To celebrate with something more fun though, it will be ice cold lemonade. Thanks! I love home brewed Sweet tea in the summer! My aunts would brew the tea in a saucepan and pour the hot tea over the sugar, adding more water and ice after the sugar is melted. 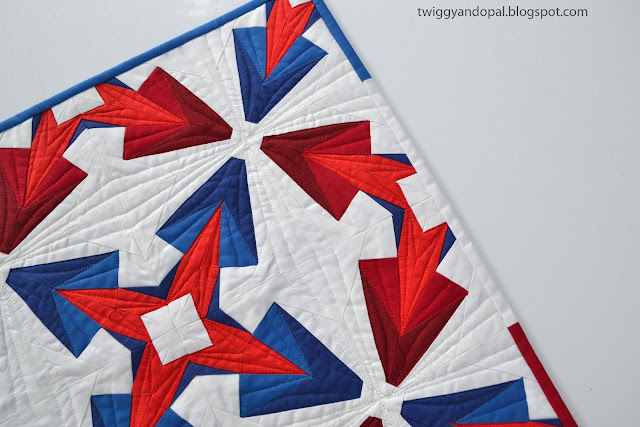 It goes perfectly with the red white and blues of your quilt! Your mini really does have the effect of a kaleidoscope! Bright and fun! I am on an iced tea kick this summer - not sweet, just the tea! Thanks for a great giveaway! Wow- that mini is gorgeous! This year we are doing watermelon mimosas. Just good 'ol pink lemonade! So refreshing. Love your quilt. Thanks so much for sharing it with us. My favorite summer drink is a Bloody Mary made with Horse Radish. Tastes like shrimp cocktail. I only drink water for the most part but I can always be enticed to drink my Mom's homemade Sweet Tea!! Love your quilt! Don't enter me in the drawing, as I'm one of the bloggers in the Blog Hop, but I did want to leave a comment telling you how great it all looks. Happy 4th of July! Does shaved ice count as a beverage? Otherwise I would have to be boring and say ice, cold water. July 4th is usually hot, so hydration is important. I would drink water, iced tea, lemonade and maybe a strawberry daiquiri. Lemonade and water melon. Thanks for sharing. It's nothing fancy, but I LOVE Snapple Diet Peach Tea! I'm a sucker for cucumber and mint infused water! Love your work! Nothing but sweet tea here in Texas, sometimes with lemon. Congratulations on the finishing of a new pattern! 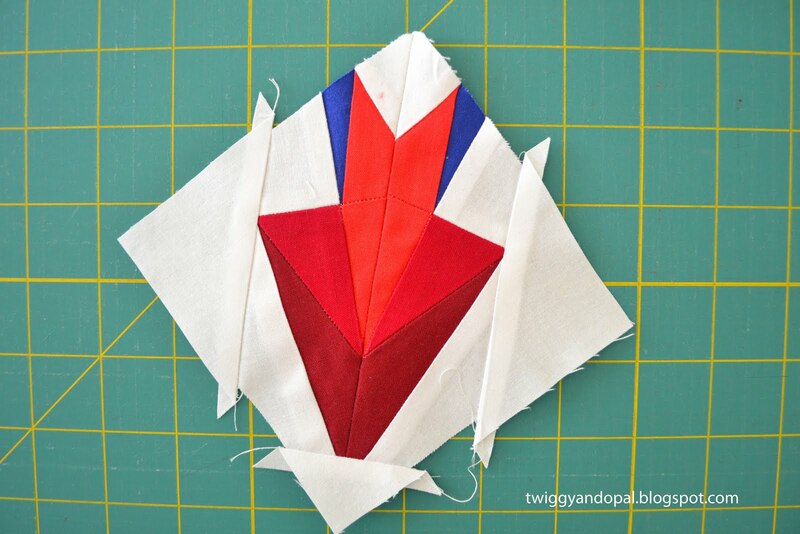 The most pattern writing I have ever done was for a New Blog Hope for one single block and it was hard! So I admire anybody who writes patterns. It's almost like having a baby! (well maybe not quite) If I'm really thirsty, nothing beats water! But if not, and I just want a sweet treat, then raspberry lemonade! I love, love the quilting on the back! Beautiful! Let's see...favorite drink for the 4th.... I am normally a water drinker, but Sweet Lemonade is great at a celebration, especially if it is hot outside! I love the firework look! Great block! I drink lots of lemonade year round but sometimes get around to making my own and adding fresh fruit in the summer. I love lemonade, the hand squeezed, sweet with the tartness of lemon over a tall glass of ice. 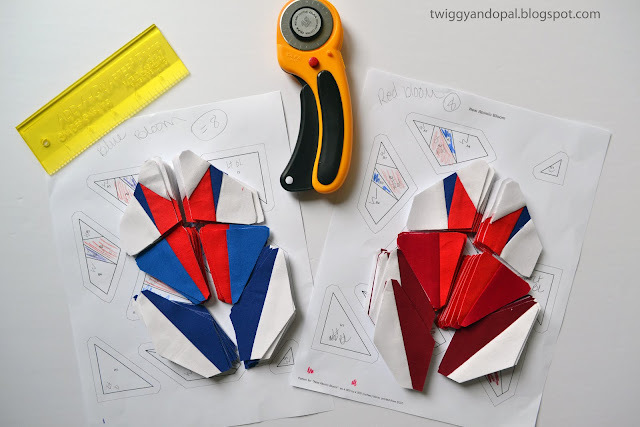 Love your paper-pieced patriotic pattern and mini wall hanging. Being a born and bred southern girl, I still enjoy iced tea in a tall glass. My favorite drink is strawberry lemonade. 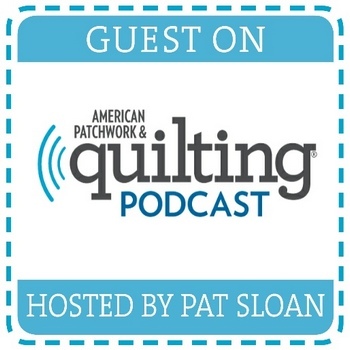 I love your Atomic Bloom quilt, and thank you for the giveaway. Your quilt is really fantastic! Way to go! I think root beer float would be high on my drink list! Thanks for linking up with TGIFF! I love strawberry lemonade or root beer. Your patriotic design is great. I must give it a try. Jayne, Thank you for your patriotism! I love Anything sour like Limeade, or a new sweet tooth item for me is Ginger Beer (nonalcholic). Love the Lobster Red Aurifil thread...really pops/blasts off on the back. Beautiful design and pattern! Any sort of cold adult beverage is great in summer.